2-Ethylpyridine-bonded silica is one of the most famous stationary phases employed in supercritical fluid chromatography, especially for the analysis of basic compounds and even without an additive in the mobile phase. In the present paper, we present the synthesis and characterization of three original stationary phases based on poly(vinylpyridine) polymers supported on silica. The position of nitrogen atom relative to the polymer chain was varied to be in the 2, 3, or 4 position. All these phases were prototypes, while the poly(4-vinylpyridine) phase was subsequently commercialized (DCPak P4VP from Daicel Corporation). The stationary phases obtained are characterized in supercritical fluid chromatography with carbon dioxide—methanol mobile phase, with a modified version of the solvation parameter model, to take account of ionic interactions. The three phases are also compared to a 2-ethylpyridine-bonded silica phase and a 2-picolylamine-bonded silica phase. It appears that the polymer-based pyridine phases are significantly more retentive than brush-type pyridine phases and adequately shield residual silanol groups to prevent unwanted interactions with basic compounds. The different selectivities and chromatographic performances are also evidenced with sample applications on pharmaceutical compounds, notably with a selection of 140 drug candidates. The online version of this article ( https://doi.org/10.1007/s10337-018-3598-x) contains supplementary material, which is available to authorized users. When developing a method in achiral supercritical fluid chromatography (SFC), the first step is most often a screening of stationary phases [1, 2]. This step is most effective when stationary phases offering a high complementarity of selectivities are available . Therefore, research is still ongoing in academic, industry, or manufacturers laboratories to provide SFC chromatographers novel stationary phase chemistries and evaluate their applicability [4, 5, 6]. One of the most famous stationary phase employed in SFC is the 2-ethylpyridine-bonded silica (2-EP, Fig. 1), which was initially introduced by Princeton Chromatography at the beginning of the year 2000, and was later copied by several manufacturers. This stationary phase is usually found to be especially useful in the analysis of basic drugs, as it was often seen to provide good peak shapes, even with simple carbon dioxide–alcohol mobile phase compositions (without any acidic, basic or salt additive). As SFC was particularly used in pharmaceutical industries at that time, and because a large portion of small-molecule pharmaceutical compounds are basic, this property rapidly promoted the 2-EP as a very desirable stationary phase. One possible reason for this advantageous behavior is that the nitrogen atom in the pyridine ligand would form a hydrogen bond with a nearby silanol group , thereby preventing any unwanted interaction between the silanol group and basic drug. It was, however, shown that not all 2-ethylpyridine phases are equivalent . This is likely due to different bonding densities and possible end-capping treatments of the silanol groups. Probably, if a hydrogen bond is indeed formed, there should be an optimal bonding density of pyridine ligands to achieve the desired protection of residual silanol groups. In the recent years, although SFC practice has changed a great deal, especially through the introduction of modern instruments, the 2-EP stationary phase is still a favorite for many sorts of applications, not only for drugs [9, 10], but also for bio-oils , lipids (steroids [12, 13] or triacylglycerols ), peptides , phenolic compounds , antioxidants , acetogenins , or cannabinoids . Princeton chromatography later produced a 4-ethylpyridine stationary phase that offered somewhat different selectivity from the 2-ethylpyridine. Waters also recently introduced a different version with the 2-picolylamine ligand (2-PIC), where the pyridine group is attached to the silica support through a more complex spacer arm, containing a polar-embedded group (Fig. 1). This novel chemistry was designed to prevent the formation of silyl ethers (through the reaction of silanol groups and alcohol mobile phase solvent) that are suspected to explain retention loss in column ageing. This novel stationary phase chemistry is increasingly popular and has already been demonstrated as an interesting stationary phase in many applications, for instance: basic drugs , nucleosides , natural products [22, 23] or environmental contaminants [24, 25]. Previously, a stationary phase made of a polymer supported on silica, poly(butylene terephthalate), was proposed for achiral SFC and proved to be highly complementary to the 2EP phases . In addition, it was found to offer excellent isomeric selectivity. In the present paper, novel pyridine stationary phases are proposed, which are all poly(vinylpyridine) polymers supported on silica gel. The position of the nitrogen atom was varied in the 2, 3, and 4 positions (Fig. 1). The last one, poly(4-vinylpyridine) or P4VP, was recently made commercially available (DCpak P4VP initially launched as DCpak SFC-B) , while the other two, poly(2-vinylpyridine) (P2VP) and poly(3-vinylpyridine) (P3VP), were prototype stationary phases designed to investigate more thoroughly the effect of nitrogen atom position on retention and selectivity. These stationary phases were compared to two other pyridine brush-type stationary phases: Acquity UPC2 BEH 2-EP and Acquity UPC2 Torus 2-PIC. The interactions established on these stationary phases were evaluated with quantitative structure–retention relationships (QSRRs) in the form of a modified version of the solvation parameter model, to take account of ionic interactions. Finally, all columns were compared in terms of retention range and peak shapes provided for drug candidates provided by Servier Research Laboratories. 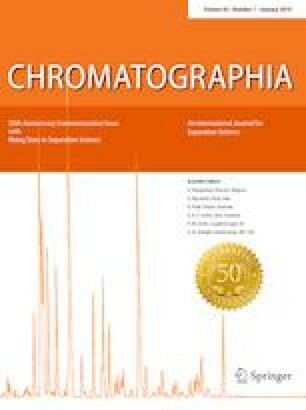 For chromatographic studies, the solvent used was HPLC-grade methanol (MeOH) provided by VWR (Fontenay-sous-Bois, France). Carbon dioxide of industrial grade 99.5% was provided by Messer (Puteaux, France). Ammonium acetate was provided by Sigma–Aldrich (Saint-Quentin Fallavier, France). 134 test compounds for QSRR analysis (Table S1 in Electronic supplementary Material) and pharmaceutical compounds (ibuprofen, fenoprofen, suprofen, indoprofen; diltiazem, diazepam, clorazepate; metoprolol, oxprenolol, propranolol, and labetalol) serving for sample applications were obtained from a range of suppliers. 140 drug candidates were provided by Servier Research Laboratories (Suresnes, France). This set previously served to develop analysis methods for impurity profiling of drug candidates and was fully described in previous works . Solutions of all analytes were prepared in methanol. The prototype of DCpak P4VP column (initially launched as DCpak SFC-B), with column dimensions of 150 × 4.6 mm, was supplied by Daicel Corporation (Tokyo, Japan) and is composed of immobilized poly(4-vinylpyridine) on 5 µm silica particles (also available on 3 µm). The other polymeric phases, P2VP and P3VP columns, were prepared according to the reported method . For comparison purposes, two other pyridine-based stationary phases were employed: Acquity UPC2 BEH 2-EP and Acquity UPC2 Torus 2-PIC, both provided by Waters Corporation (Milford, MA) with identical dimensions (100 × 3.0 mm, 1.7 µm). The chromatographic system was an Acquity Ultra-performance Convergence ChromatographyTM (UPC2®) from Waters (Milford MA, USA). It was equipped with a binary solvent delivery pump compatible with mobile phase flow rates up to 4 mL/min and pressures up to 414 bar, an autosampler that included partial loop volume injection system, a back-pressure regulator (BPR), 2-position column oven compatible with 150 mm length columns and a photodiode-array (PDA) detector. The Empower®3 software was used for system control and data acquisition. The extracted wavelength for UV detection was 210 nm. Frequency was set at 20 pts/s and resolution at 1.2 nm. QSRR characterization and sample applications were all performed at 15 MPa outlet pressure, 25 °C oven temperature. The mobile phase was carbon dioxide–methanol 90:10 (v/v) pumped at 3 mL/min for the polymeric phases and 1 mL/min for the ligand-bonded phases, as they had different dimensions and particle size. For the analysis of Servier drug candidates, the mobile phase was a gradient of methanol containing 2% water and 20 mM ammonium acetate, from 5 to 50% in carbon dioxide. For sample applications with commercial pharmaceutical compounds, mobile phase composition was changed as indicated in figure captions. Retention factors (k) were calculated based on the retention time tR, determined using the peak maximum and on the hold-up time t0 measured as the first baseline disturbance. Multilinear regressions were performed using the XLStat 2017 software, version 19.03.44850 (Addinsoft, New York, NY). The quality of the QSRR fits was estimated using the adjusted determination coefficient (R2adj) and standard error in the estimate (SE). In certain conditions, the retention of some analytes was too low (elution in dead volume); thus, they were excluded from the calculations. In all cases, a sufficient number of analytes with adequate diversity were retained in the final set to ensure that meaningful models would be obtained. In addition, the coefficients must make chemical sense. Values of the system constants must be both large and significantly larger than their standard deviation. In this equation, capital letters represent the solute descriptors, related to particular interaction properties, while lower case letters represent the system constants, related to the complementary effect of the phases on these interactions. c is the model intercept term and is dominated by the phase ratio. E is the excess molar refraction (calculated from the refractive index of the molecule) and models polarizability contributions from n and π electrons; S is the solute dipolarity/polarizability; A and B are the solute overall hydrogen-bond acidity and basicity; V is the McGowan characteristic volume; D− represents the (partial or total) negative charge carried by anionic and zwitterionic species; and D+ represents the (partial or total) positive charge carried by cationic and zwitterionic species. The system constants (e, s, a, b, v, d−, d+), obtained through a multilinear regression of the retention data for a certain number of solutes with known descriptors, reflect the magnitude of difference for that particular property between the mobile and stationary phases. Thus, if a particular coefficient is numerically large, then any solute having the complementary property will interact strongly with either the mobile phase (if the coefficient is negative) or the stationary phase (if the coefficient is positive). The system constants are thus related to the interaction capabilities of the chromatographic systems controlling the retention and selectivity. Exhaustive information on the solvation parameter model and its application to the characterization of chromatographic systems can be found elsewhere. The Abraham solute descriptors (E, S, A, B, V) used for QSRRs were extracted from an in-house database established from all available literature on the solvation parameter model, and based on calculations with the Absolv module in ACD I-lab (https://www.ilab.acdlabs.com/iLab2/index.php). For the purpose of simplicity, the two additional descriptors (D− and D+) values were calculated based on apparent pH estimated to be close to 5 and aqueous pKa values determined with Chemicalize (http://www.chemicalize.org/). This may seem a rough approximation, but retention prediction was not an objective, only some understanding of the retention mechanisms. The series of test compounds has been selected by observing the requirements of a good QSRR analysis. First, the three polymer-based stationary phases were characterized with the modified solvation parameter model and compared to 2-EP and 2-PIC. The results obtained can be observed in Fig. 2. The statistics related to the models can be found in Table S2 in Electronic Supplementary Material. A first general observation is that the patterns of interaction terms are similar to all five stationary phases, with the sign and magnitude of all terms being mostly in the same range. This was not unexpected as they all share a common feature: the pyridine ring. For all five columns, the most significant contribution to retention is in the a term, related to hydrogen bonding between proton-donor analytes and proton-acceptor stationary phase. We may expect this to issue from the nitrogen atom that is present in all stationary phases, in the pyridine ring and also possibly in the spacer arm for 2-PIC. Although it is still the most significant interaction term, the a term is, however, significantly smaller on the BEH 2-EP phase than on the other four. If the hypothesis of hydrogen bonds existing between the nitrogen atom and residual silanol groups is true, it is reasonable to assume that a portion of the pyridine nitrogen atoms in BEH 2-EP is not available for interaction with the analytes, thereby reducing the overall capability for hydrogen bonding. In the 2-PIC stationary phase, the a term is slightly smaller than on the polymeric phases but still much larger than in the 2-EP phase. Probably, as the ligand is much longer in 2-PIC than in 2-EP, the pyridine nitrogen atom has less possibilities to interact with residual silanols. This pattern is somewhat reflected in the variations of the d− term, although the values are much smaller: the polymeric phases and the 2-PIC phases have the largest (and positive) values, while the 2-EP phase has very low, nearly non-significant value. This indicates that these four phases are all capable to interact with anionic species. This could mean that the nitrogen atom in the pyridine function would be (at least partly) protonated to participate in electrostatic interactions with negatively charged species. The acidity constant of pyridine is about 5.2 in aqueous media, while the apparent pH of the carbon dioxide—methanol mobile phase was estimated to be near 5 . Thus, it is possible that a portion of the pyridine groups would be in the pyridinium form. The other hydrogen-bonding term, the b term related to interactions between electron-donor analytes and proton-donor stationary phase, is much smaller than the a term. Indeed, it is not significant (near zero) on the polymeric phases, indicating that hydrogen bonds between electron-donor analytes are of the same magnitude with the polymeric stationary phase as they are with the mobile phase. On the ligand-bonded silica phases, however, the b term is weakly positive but significant (b value is larger than standard error). On the 2-EP phase, it may result from interactions with silanol groups, while on the 2-PIC phase, it may also issue from interactions with the above-mentioned polar groups in the spacer arm. In addition, the ligand in 2-PIC also contains other atoms contributing to hydrogen bonding with O, OH, and NH groups being present in the spacer arm. While the a and d− terms were somewhat related, no relation is observed between the b and d+ term, confirming that they do describe different interactions: while b may be related to the retention of bases in their neutral form, d+ is related to the retention of bases in their protonated, cationic form. The values of d+ term are positive but very small, even non-significant on P4VP and 2-PIC (standard error is larger than d+ value). This may be related to (1) efficient protection against interactions with residual silanol groups and (2) repulsive interactions with the partly protonated pyridine functions. The latter suggested cause is also supported by the fact that the d+ values are slightly decreasing from P2VP to P3VP and P4VP. In the case of P4VP, the orientation of the nitrogen atom, laterally oriented from its main chain, may be more favorably contributing to this electrostatic repulsion than in the case of P2VP, where it is directed towards the main chain. In the case of 2-PIC, the long spacer arm is probably a favorable feature, together with the polar-embedded groups in this spacer arm, to shield the silica surface from the analytes. From the observation of the b and d+ terms, good performance for basic compounds may be expected on the polymeric phases as they all have little capability to retain them through specific interactions. Two other terms have significant positive values, the e and s terms. The e term is related to the presence of π and non-binding electrons contributing to the polarizability of the analyte. The e term may thus encode some dispersive (London) interactions, induction (Debye) interactions with dipoles in the stationary and mobile phase, and also the contribution of π–π interactions. The e term values are all positive and second only to the a term, indicating a significant contribution to the retention process. The aromaticity of all pyridine rings accounts for this fact. The largest e value is observed for P4VP, followed by 2-PIC, while the 2-EP has the lowest e value. The s term is related to the presence of dipoles in the analytes. The s term may thus encode also some part of induction (Debye) interactions between dipoles in the analytes and a polarizable stationary or mobile phase, but also orientation (Keesom) interactions between dipoles in the analytes and dipoles in the stationary and mobile phases. The s values are also positive but smaller than the e values. The s values on the three polymeric phases are larger than on the two ligand-bonded phases. Two explanations may be proposed for this observation. A higher density of aromatic pyridine rings in the polymeric phases than in the ligand-bonded phases may be suggested that would explain higher contributions of induction and orientation interactions. In addition, some pending vinyl groups might remain that would not have reacted in the polymerization process, which would also contribute to e and s values. The v term is related to the size of the analytes. It may include the contribution of dispersive (London) interactions, but also some contribution of steric repulsion as a cohesive stationary phase would prevent insertion of bulky analytes. The v term was negative for all five stationary phases, as is usually observed for polar stationary phases employed in SFC, suggesting a “normal-phase behavior”. The v values were most significant on P4VP and 2-PIC. High cohesiveness of the 2-PIC ligands is a possible explanation as the polar-embedded groups (O, OH, and NH) possibly participate in hydrogen-bonding interactions between neighboring ligands. Finally, the c term is the equation intercept. It encodes the contribution of phase ratio and is thus somewhat reflecting the contribution of changes in the volume of stationary phase relative to dead volume. However, it also comprises all contributions that are not correctly described by the seven interaction terms. As such, its interpretation is limited and it will not be further discussed. As a conclusion on this section, all five columns are much alike in terms of interaction capabilities, with some significant variations marking (1) a difference between the polymeric phases and ligand-bonded phases (b term), (2) significant differences between the two ligand-bonded phases (e, a, v, d−, and d+ terms), and (3) progressive variation among the polymeric phases in the order P2VP, P3VP, and P4VP (e, d, v, and d+ terms). A set of 140 drug candidates were analyzed on all five stationary phases with gradient elution and a mobile phase containing additives (2% water and 20 mM ammonium acetate). While additives may not always be necessary to alter unwanted analyte—stationary phase interactions, they are useful to favor the solubility of polar ionizable drugs. This set of analytes was previously used to develop a generic method for impurity profiling of drug candidates in SFC [28, 31, 32]. As it is representative of small-molecule drug development, it comprises a majority of bases, but also some acidic and neutral species. Figure 3 shows representative comparisons of the retention times measured. 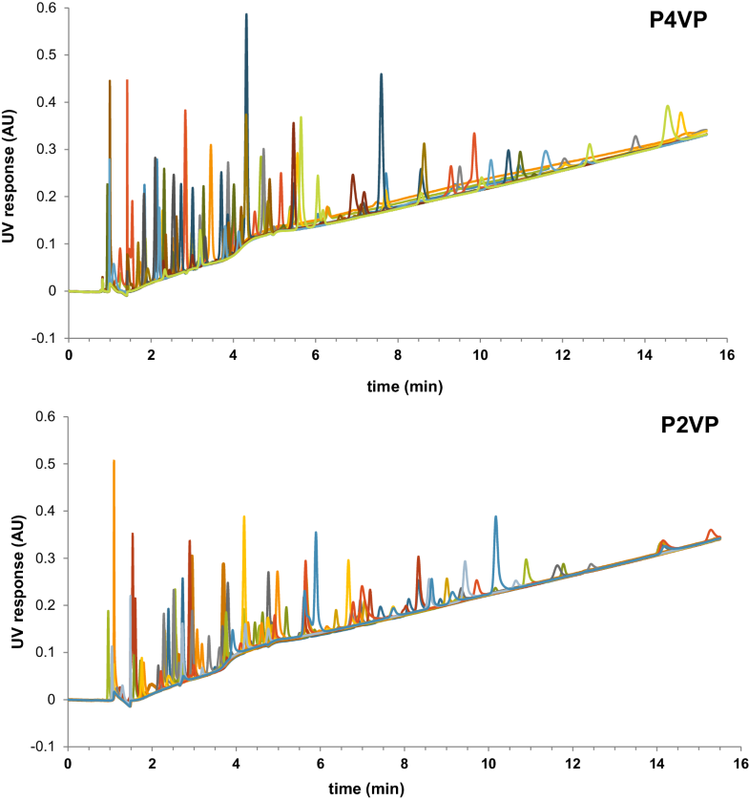 Between the polymeric phases (P2VP and P4VP are displayed in Fig. 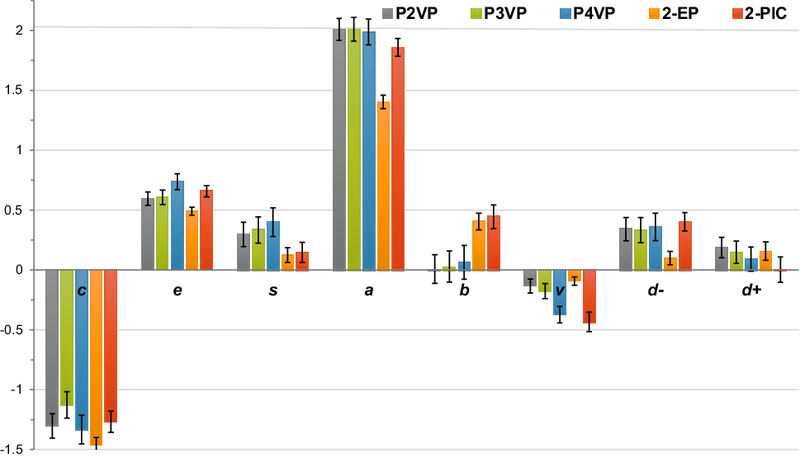 3a), a regular progression towards more retention is observed in the order P2VP, P3VP, and P4VP. While the low-retention analytes behave have nearly identical retention times on all three columns, the most retained analytes interact more strongly with the pyridine rings when the nitrogen atom is oriented upwards, as was commented in detail in the previous section. 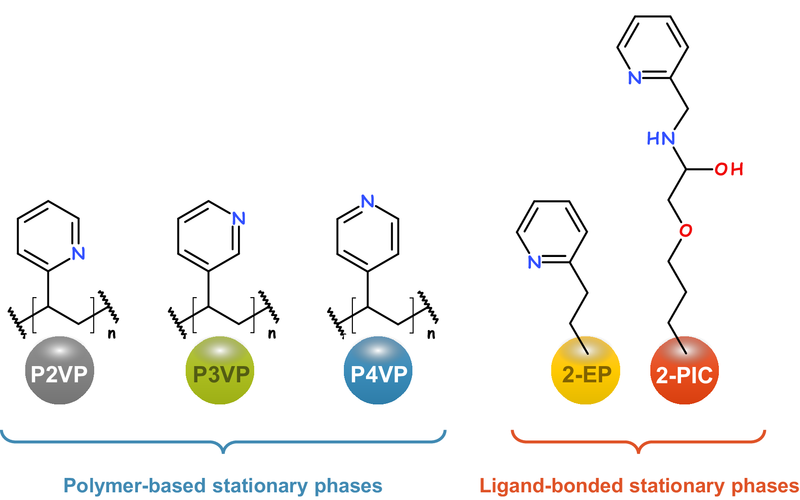 When comparing polymeric phases to ligand-bonded phases (P4VP and 2-PIC are compared in Fig. 3b), the polymeric phases are significantly more retentive than the ligand-bonded phases. However, no particular group of analytes (neutrals, acids, or bases) is singled out: all of them are affected. Both figures seem in accordance with the above observations that the two groups of stationary phases have some measurable differences in their interaction capabilities and that a regular progression was seen among the polymeric phases depending on nitrogen atom orientation. In Fig. 4, some chromatograms obtained on the P2VP and P4VP phases are shown. Ammonium acetate was used in the mobile phase there to favor elution of less soluble basic drugs, although it is causing some baseline drift. In general, equally, good peak shapes were observed on all phases, with some changes in elution order, according to the observations in Fig. 3. However, the highest retention of P4VP phase appears advantageous as the analytes are then better spaced out in the range of the gradient, which is generally affording better selectivity in complex mixtures. Finally, some commercial drugs were analyzed to further illustrate the differences between the three polymeric phases (Fig. 5). Three families of drugs were examined: propionic acids (Fig. 5a), benzodiazepines (Fig. 5b), and beta-blockers (Fig. 5c). 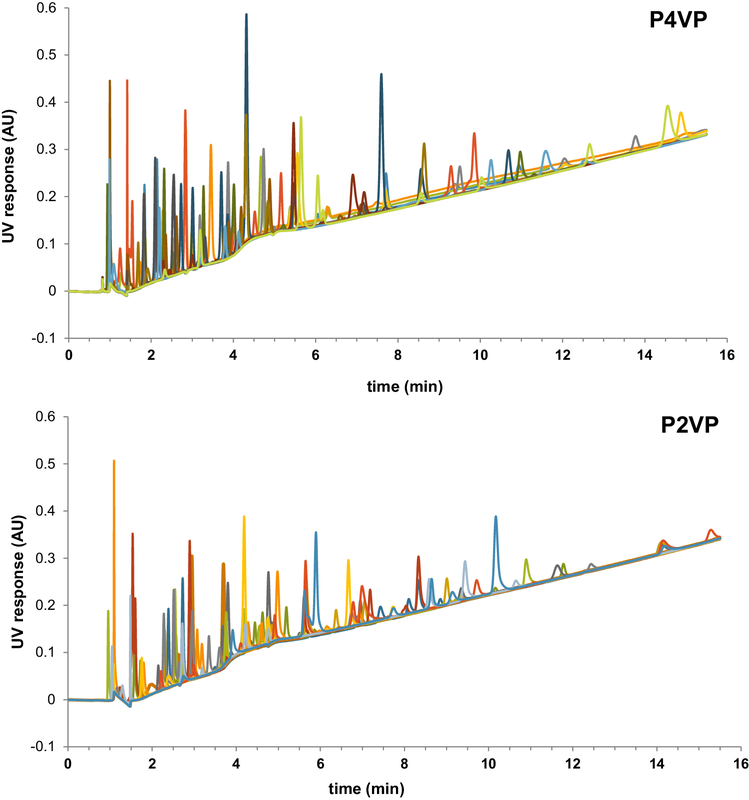 In these chromatograms, it can be seen that the P3VP and P4VP phases generally provided more retention and improved selectivity over P2VP, in accordance with the above observations. Indeed, the four propionic acids were baseline resolved on P3VP and P4VP and the impurity was adequately resolved from benzodiazepines with these phases. In the chromatograms of beta-blockers, only the P4VP phase provided some debut separation of metoprolol and oxprenolol. The large peak observed for labetalol on P3VP and P4VP was due to a debut separation of diastereomers as labetalol has two chiral centers. The peak shapes were also slightly better on P3VP and P4VP than P2VP, which may be simply due to differences in the packing quality. As the phases tested here were only prototypes, the packing quality and supporting amount had not been optimized yet. 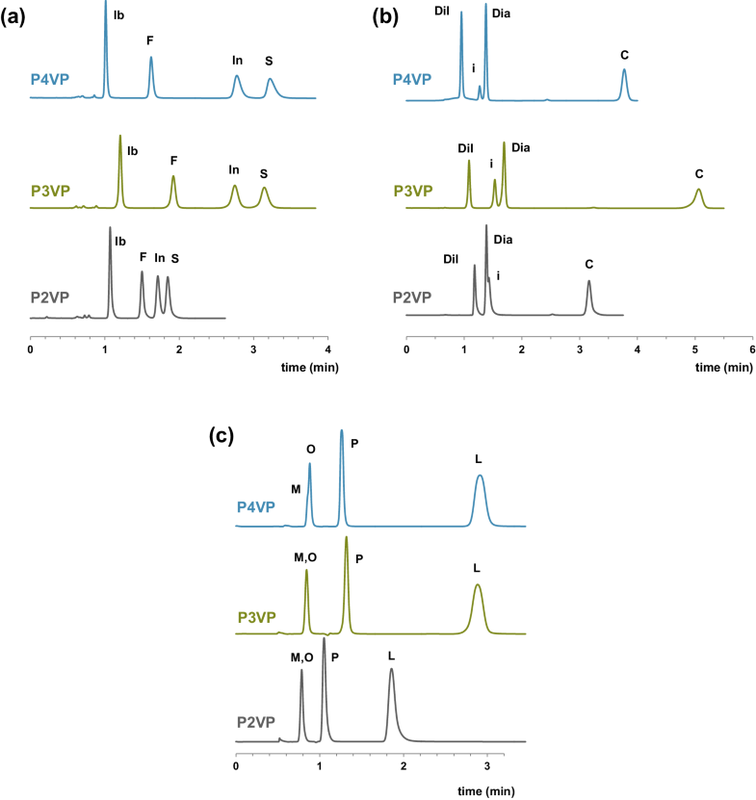 The characterization of pyridine-based stationary phases in supercritical fluid chromatography was achieved through a modified version of the solvation parameter model taking account of ionic interactions. The three polymeric phases were distinguished from the ligand-bonded phases especially for the retention of neutral bases. The two ligand-bonded phases were shown to be different from each other with the 2-PIC phase generally providing a better shield for silanophilic interactions. Among the three polymeric phases, a regular variation of interaction terms was observed depending on the orientation of the nitrogen atom. 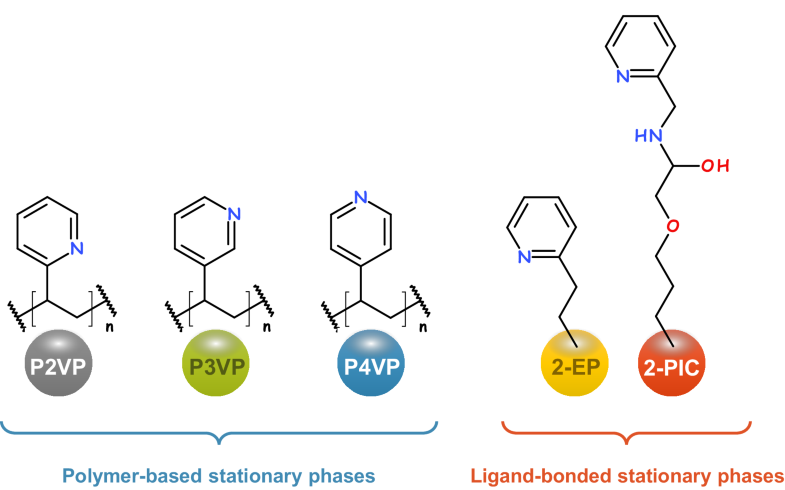 This resulted in generally improved retention and selectivity for all categories of analytes (neutrals, acids, or bases) when the nitrogen atom was oriented laterally to the main chain (P4VP and P3VP). Peak shapes were also shown to be good on drug candidates and commercial drugs. Waters Corporation is warmly acknowledged for continuous support provided to Univ Orleans through the Centers of Innovation program. CW acknowledges the support of the Institut Universitaire de France (IUF), of which she is a Junior member.